The parking lot would be established in San Marcos. (KGTV) -A nonprofit group is stepping up to find a solution following complaints of people living out of their cars across neighborhoods in San Diego. In February, the City of San Diego unanimously voted to repeal a 1983 city ordinance preventing people from living out of their vehicles. The change cleared the way for vehicle dwellers to live on any street within San Diego. A newly-formed resident coalition is documenting what it says are the problems the ordinance created. The information is being sent to San Diego Mayor Kevin Faulconer’s office. “We have literally witnessed buckets of waste being thrown out of some of these vehicles. I’ve witnessed drug dealing out of some of the motor homes, we’ve seen bike chop shops operating,” Pacific Beach resident Racheal Allen said. City councilwoman Jennifer Campbell recently proposed the city-owned South Shores parking lot near SeaWorld as a designated site for people living out of their cars. Some people had already began using the parking lot as a camping site, but some residents expressed discontent with that solution. The issue is a concern well beyond San Diego’s city limits. 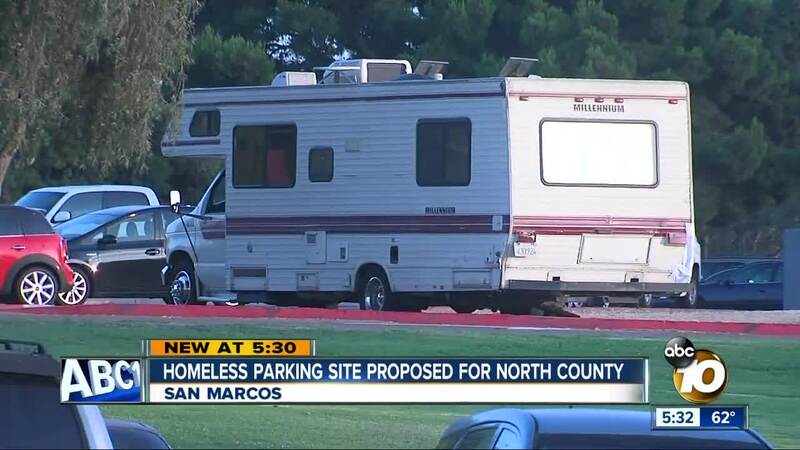 A nonprofit group, Jewish Family Services, is now working on a proposal that could potentially turn a privately-owned church parking lot in San Marcos into a designated space for these campers. A San Marcos resident said he’s not opposed to the idea, but he would need to know more about the specifics before taking up a stance on the issue. “How is it going to work, how are they going to control who comes and goes, how are they going to manage the security, the safety, and the health, I think first and foremost, and then what are they going to do if it somehow starts negatively impacting the community,” said Ruben Galvan. Jewish Family Services officials said the group is in the exploration phase of the proposal and is reviewing different sites as options. “If they control the situation it could probably work, for both the unfortunate homeless people and the community, I think they just need to monitor it and say, ‘hey, if it’s not working, we’ve got to figure something different,” Galvan said.